Automate your postcards with a recurring campaign. Choose a schedule and audience, set a budget, and we’ll take care of the rest. In this article, you'll learn how to create a recurring postcard campaign. Make sure you’re familiar with how postcards work in Mailchimp, including pricing and delivery estimates. To learn more, check out About Postcards. Learn how to review your existing address data in Mailchimp or format and import new addresses. For GDPR compliance, you'll want to create and send to segments that only include contacts who have consented to direct mail. Postcards do not support merge tags at this time. Security and nonprofit discounts do not apply to postcards at this time. The recurring campaign automatically sends postcards at regular intervals on your behalf. You can use this campaign to showcase a product, remind people of events, share promo codes, and more. With each new send, we’ll check your audience for new contacts or addresses, and order as many postcards as your budget allows. Between sends, you can pause and edit the schedule, budget, or content of your postcard at any time. The people in the audience you choose will receive a postcard with every recurring send, unless you use segmentation to filter them out. For example, if you only want to send a monthly postcard to new subscribers, you might target a segment with the parameters Date added | is within the past 30 days. To create a recurring postcard campaign, follow these steps. Enter a campaign name and click Begin. This will take you to the the builder, where you’ll decide on a schedule, choose an audience, set your budget, and add your content. To choose how often your recurring campaign will send, follow these steps. 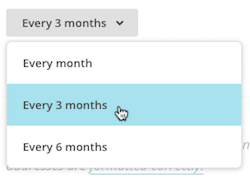 Click the drop-down menu and choose Every month, Every 3 months, or Every 6 months. You can send postcards to any type of contact, regardless of their email marketing status. The higher your budget, the more people you have the potential to reach. With recurring postcards, your budget is the maximum amount you’re willing to spend on each recurring send. For example, if you set a $100 budget and schedule your campaign to send every month, you’ll be charged up to $100 a month as long as your campaign is active. To set your audience and budget, follow these steps. In the To section of the postcard builder, click Add Recipients. Click the Audience drop-down menu to choose the audience you want to work with. Click the Segment drop-down menu to refine your audience. By default, this is set to target All contacts in your audience, including unsubscribed and non-subscribed. You can only send to a custom segment if you’ve saved it ahead of time. In the Budget field, enter the maximum amount you want to pay for each recurring send. The more postcards you send, the less you’ll pay per unit. To see the different pricing tiers, click View postcard pricing. The amount you can spend on postcards is limited to $10,000 per day. After you save, we’ll review your audience for available addresses. Then, we’ll display the total cost of your send, including postcards, postage, and sales tax. The cost of each recurring send may vary if you add or remove contacts or addresses, but will never exceed your budget. Choose a main image for the front of your postcard, and add a heading, body text, and optional brand logo to the back. You can also include a promo code from your online store. Content will appear on the preview as you add it. To add content to your postcard, follow these steps. In the Content section of the postcard builder, click Add Content. In the Front section, click Browse and choose an image from the Content Manager. This will be the Main image for your postcard. Here are some things to consider when you choose this image. Postcards support JPEG and PNG file types only. We recommend a minimum image size of 1875-by-1350px to ensure a high-quality print. We’ll automatically convert your image to CMYK color. Digital photos display darker in print. If your image is very dark, you may want to brighten it a little bit. In the Back section, enter a Heading and Body. 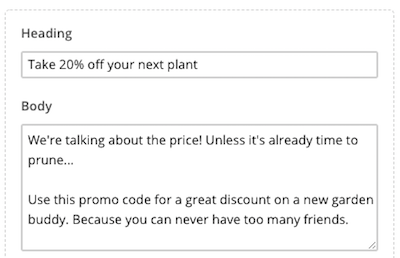 Optional: To include a promo code from your connected online store, check the Include promo code box, then click the drop-down menus to choose a store and code. You’ll need to create the code in your store before you can add it to a postcard. We’ll track purchases made with this code and display the usage and revenue totals in your postcard report. For the most accurate results, we recommend you create an exclusive promo code for each postcard campaign. Optional: In the Logo section, click Browse to choose a JPEG or PNG image file from the Content Manager. This will appear on the bottom left of the back of your postcard. Nice job! Now that you’ve designed your postcard, you’ll want to preview it to make sure everything looks good and prints as expected. When your postcard goes to the printer, they’ll trim the sides so that the design extends to the edges. 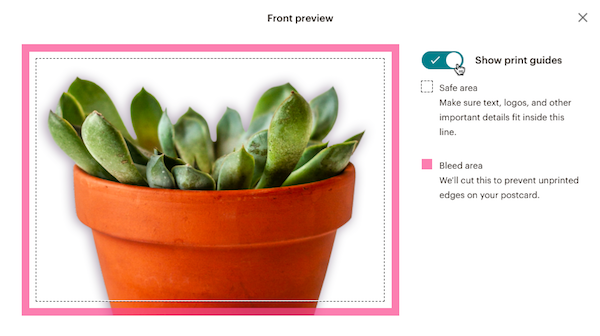 Our postcard preview tool shows you exactly where they’ll cut, so you can make sure important details won’t be removed. To preview your postcard, follow these steps. Click the preview for the Front or Back of your postcard. 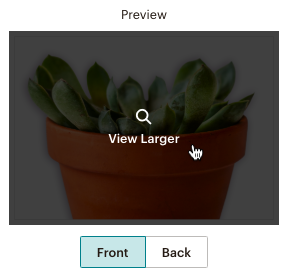 In the preview modal, toggle on the Show print guides slider. You’ll see lines that mark the Safe area and Bleed area. We recommend you keep all important details, such as text, inside the dotted line. Review your postcard and click the X in the upper-right corner to exit the modal. After you’ve entered your settings and previewed your content, you’ll be ready to send. We’ll begin to process the first postcard order as soon as you start your campaign. To start your recurring postcard campaign, follow these steps. In the Prepare for launch modal, click Start Sending to confirm. Great job! Your campaign will display as Processing as we prepare to send your order to the printer. To view your report, navigate to the Reports section of your Mailchimp account and click the name of your postcard campaign. Here’s what you’ll find in your postcard campaign report. Follows each send order to delivery. The tracking stages are: Order placed, Sent to printer, Printing complete, Mailed, and Delivered. The Delivered status is currently limited to U.S. recipients. Matches the tracking tool and includes a timestamp where possible. This will display as “Processing” as we review the most recent order. Who you chose to receive your campaign. The number of postcards sent to date. If your audience includes recipients outside the U.S., we’ll also show you a breakdown of U.S. and international sends. The amount spent on all sends to date. If your postcard includes a promo code from your connected store, we’ll show you the number of times it's been used, as well as the total revenue generated from those purchases. Your report will also display the front and back of your finished postcard. Use Mailchimp postcards to share promo codes, announce an event, recover abandoned carts, or just say thank you. Learn how to create and send a printed postcard campaign in Mailchimp. When a customer leaves an item in their shopping cart, recapture their attention with a printed postcard that encourages them to return to your store.